Jesus said, "Go therefore and make disciples of all the nations ..." (Matthew 28:18-20). 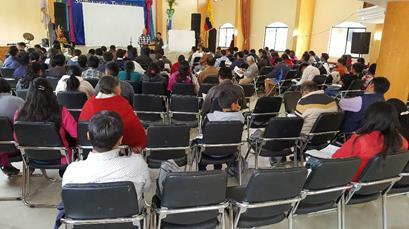 Above photo of Wil preaching at the Abide in Christ Pastors' Conference at Peniel Theological Seminary in Riobamba, Ecuador, July 31-August 3, 2017. This week I saw the fruit of eight years of ministry fulfilled. There was such a sweet, sweet spirit, with the excitement and expectations from students and pastors. It was the sweetest experience. Sometimes it is years later when pastors and missionaries see results of ministry. We all look forward to the day when we hear our Lord says, "Well done, good and faithful servant." The conference has grown each year as pastors come in from all over the country. This year we had the best attendance ever during the daytime sessions. The night sessions were open to the general public and crowds overflowed into the street. Dr. Rick Cain speaking on systematic theology at Peniel Theological Seminary Pastor's Conference. During the daytime, four of my presentations were on our vital union with Christ from Romans 6:1-14. Monday night I preached on the topic the man God uses, and then "the man of God" from Second Timothy at the Peniel Seminary graduate's dinner on Saturday night graduate's dinner. I also translated for Dr. Cain at the sessions, and at Genesis Bilingual Quichua Church where Alejandro Guacho pastors. Richard Aguilar translating for Dr. Cain at one of the day sessions. 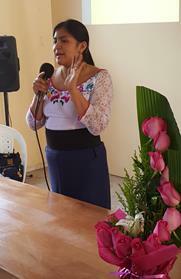 Richard also began each day with excellent Bible Studies for the participants. This was his third conference with us. He pastors a church in the capital city of Quito. 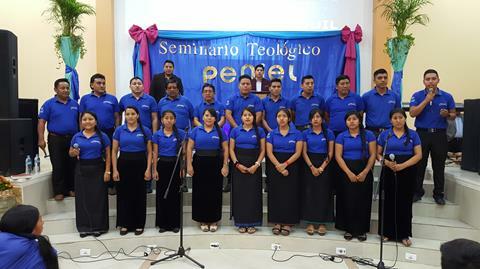 Guayaquil seminary extension choir singing at Peniel Theological Seminary Conference. Dr. Rick Cain, a graduate of Dallas Theological Seminary, gave six presentations on systematic theology. These were well received by pastors and students. Dr. Cain is also a dentist and has made two medical dental trips to Ecuador with our team, and will return next March on a dental team. He is committed to return as a continuing education speaker. Cindy Aguilar, Abigail and Nancy Copa gave presentations to the women's part of the leadership conference. This has grown and is well attended. Cindy spoke on the ministry of mothers in prayer; Nancy gave morning Bible devotions, and Abigail spoke on nutrition and meal planning. All three emphasized the Biblical themes. Abigail graduated from the university as a trained dietician, chef, and restaurant management. Her husband will graduate next year from the university as a chef. He is also a student at Peniel Seminary. He and Abigail and other students are active in their church a Peniel missions. Rector of Peniel Seminary Alberto and Nancy Copa with Wil and Rick at conference. The weekend was spent at a retreat in Puyo with 25 youth from Genesis Bilingual Church. 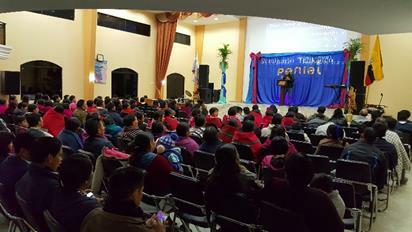 Genesis Bilingual Quichua Church Youth Retreat in Puyo. 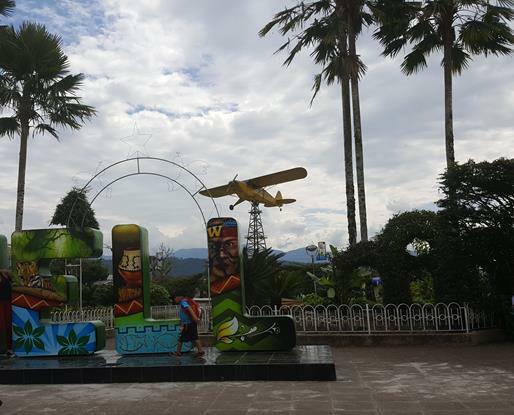 Memorial to Missionary Martyrs in Shell Mera,Ecuador. 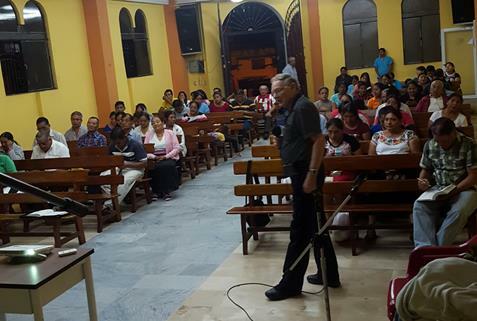 Three days were packed with services on the doctrine of sanctification at Mount of Olives Quichua Church in Santo Domingo. 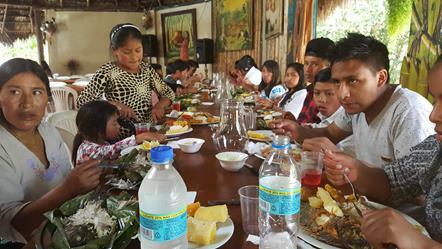 This was a follow-up on conferences on personal evangelism, the doctrine of justification by faith, and how to maintain sound doctrine in the local church. Wil speaking at Mt. Olives Eilingual Evangelcial Church in Santo Domingo, Ecuador. 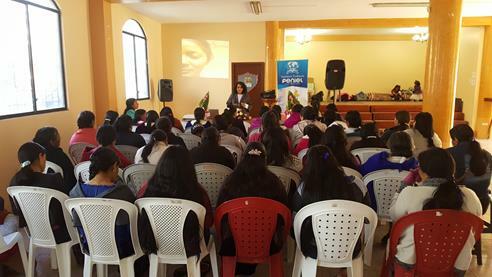 Then Alejandro and I conducted a one day evangelism youth conference in Guaranda. I introduced evangelism in depth, gave New Testaments and showed them how to mark the plan of salvation, and gave a personal witnessing demonstration. We are planning on a follow-up youth conference there next year. 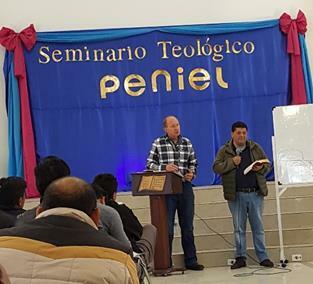 On the third week I was back to teaching a 40 hour Peniel Seminary course on Christology at the Pintag extension near the capital city of Quito. Students at Pintag Seminary Extension. ü Evangelism in Depth, and Key Bible Doctrines Conference at Hebron Baptist Church in Tegucigalpa, Honduras, September 8-19.
ü Third medical-dental team returns to Alao, Ecuador, October 13-22.
ü Praise the Lord! Property for the Riobamba campus has been paid in full. ü Pray for wisdom for building design, God's provision of funds, and volunteer construction work teams. ü Pray for 180 students and professors as they begin a new school year at Peniel Theological Seminary. 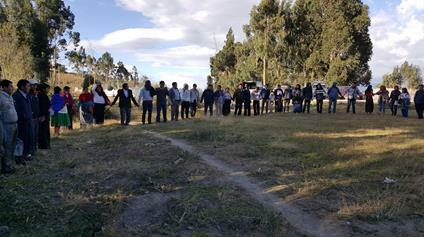 ü Pray for evangelism teams to go door to door witnessing in this unreached area of Riobamba. Our goal is to plant a new church and use the seminary building for worship services. Pray for Alejandro as he leads this ministry. 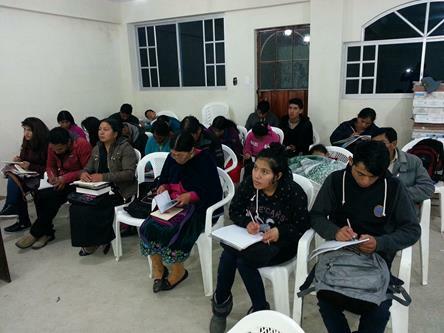 ü Pray for Alejandro Guacho and Peniel Seminary students at the new church startup in Alao, Ecuador. They are following-up on the medical team, and are encountering intense persecution by the catholic priest. 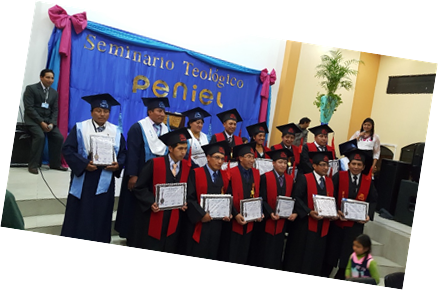 ü New Peniel Seminary extensions begin classes in central Quito, and Ambato, Ecuador. 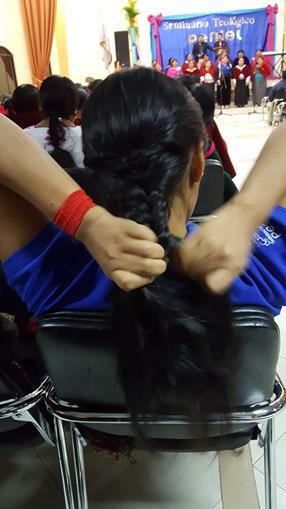 I will be teaching in these new extensions next year. 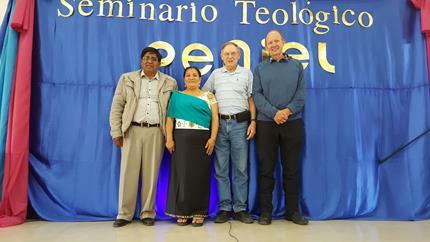 ü Alberto and Nancy Copa, and professors at Peniel Theological Seminary in Riobamba, Ecuador. ü Wisdom for Wil and Ann Pounds and Abide in Christ board as we seek the Lord's direction for future ministries of Abide in Christ. 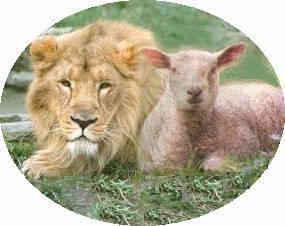 Abide in Christ, Inc. is a registered 501(c)(3) non-profit organization. (c) 1996-2016 Abide in Christ, Inc.